The Romanian-American University Library, cultural-scientific structure, is part of the training-educational process of research and improvement, of discovering the national and universal cultural and scientific values. Set up in 1991, the library has a total of publications of more than 60.000 volumes. The organizational and functioning system of the library was based from the very beginning on the international standards of library economy and information science, permanently complying with the profound and frequent changes in the Romanian society. The library collects, organizes and capitalizes book funds, serial publications and other specialized documents, cooperates with central university libraries and with those of high education institutions to insure maximum efficiency to the completion, organization and use of the publications collections, as well as to the bibliographic activity and documentary information. The completion of the library collections is done through periodical book acquisition according to the bibliographic recommendations in the study plans, to the specific subjects of study and the type of faculty. Furthermore reference materials are acquired to support the studying and research activities (dictionaries, encyclopedia, law codes, atlases, guides, etc.). The library is developing a program concerning the inter-university exchange of publications and attracting donations of Romanian and foreign book, as well as cooperation with organizations, institutions, libraries, documentary information unities within our country and abroad. The library has enriched its publications fund with extremely valuable foreign writings received as donations from James Madison University, American University, the academician Constantin Corduneanu, the American-Romanian Academy, De Sales University, UNO Library and many other prestigious organizations. These writings, together with those received from the International Management Foundation, as well as the Harvard Business Review, and The Economist magazines, represent an informational and documenting basis of actuality in the economic field. The E-Ligrary (virtual library) - which comprises a new and well equipped IT lab providing access to the most important international scientific data bases - is part of the RAU's Library, being an ambitious and complex project that aims to create a new type of knowledge collections in a variety of electronic formats. The E-Library is also a necessity imposed by the new trends and requirements of the modern society based on information and knowledge. Computerization of our own activities in order to create the informational base of the learning process. The Romanian-American University promotes Open Access to research, knowledge and information, encouraging its researchers, academic staff and students to embrace a scientific culture towards more openness and to publish in the university's repository, in order to increase visibility and usage of the research findings. 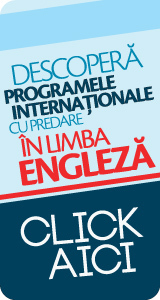 Besides the Library of the Romanian-American University, there is also the University Bookshop which sells the publications necessary to the development of the learning process and it there is a permanent concern with purchasing books, manuals and tests to ensure an optimum climate for study. A large number of textbooks and university courses, as well as other publications, can be purchased in electronic form (CD-ROM, e-book etc. ).